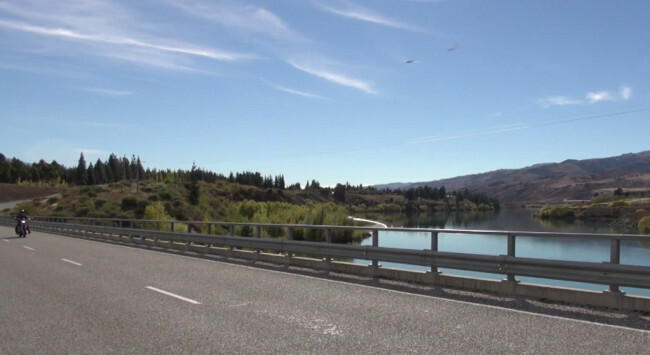 An Australian television production crew unknowingly filmed a pair of UFOs over the New Zealand town of Queenstown. In the past week, when editing of the episode was complete Graeme noticed something strange in a wide shot – two objects travelling from left to right of the screen at great speed. When the images were slowed to a frame by frame sequence you could see the shapes emerge from the trees and move across the sky, eventually disappearing. Birds are a possible explanation for the UFOs as these objects seemingly emerge from the trees and move quickly through the sky. But in response to this possibility, Colour In Your Life posted to their Facebook page, “From the trees to where I was on the bike is about a half a kilometer. If you look at the speed in real time, that means that if it were birds they would have accelerated to about 4,000 kilometers an hour in one second.” Some have also suggested the possibility of military aircraft. But the crew again points to the incredible speed of the objects and the lack of nearby air bases to rule out traditional aircraft. It seems peculiar for a production company of a TV show to issue a press release, or “Media ALERT,” as they’ve titled it, about UFOs in recorded footage. Although it may seem like a marketing ploy for the show, it is possible that the production company is genuinely interested in identifying the mysterious aerial objects they captured on film. 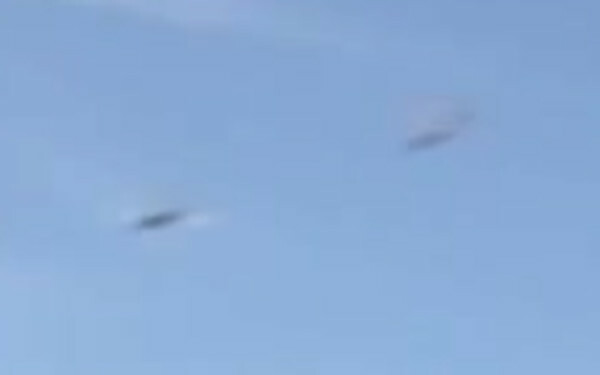 What do you think these two fast-moving objects are? Share your thoughts by leaving a comment below, or by posting on the Open Minds Facebook page. I’ve been watching your video on the vapour trail seen during April, a similar thing was spotted by myself and a few others here in Hastings last Friday. A short vapor trail at about 4:30pm. It looked like a meteor had burned up on entry. Not withstanding the Loeinid Meteor shower is in progress we are also getting alot of cometary debris from what was supposed to be the comet of the century, we are passing through this debris trail at the moment so these phenomena and the frequency are stepping up world wide as we move through the thickest part of the debris field, which we will begin to come out of by the end of the month. so much more of this type of phenomena can be expected, Russia and the United States have had their fair share recently. If the objects are close to the camera like insects or birds then they could be going a lot slower and appear to be moving very fast. Yawn. They are heading toward Wanaka where they have the warbirds over Wanaka every second year. There were several fighter jets from the northern hemisphere this year.